In the coming weeks, college acceptances will start rolling in for a select group of high-school seniors vying to get into the three dozen or so most-selective colleges and universities in the country. Most seniors planning to go to college this fall already have been accepted somewhere, either because they applied early or they chose less-selective schools that notify applicants almost immediately of their decision. But for those waiting to hear from Harvard, Stanford, Williams, and other elite schools, this time of year is one of high anxiety. By May we’ll hear yet again from those campuses bragging about how they set records for the number of applications they received this year and how few students they accepted — likely about one out of every 10 applicants. For all the attention showered on these elite college and universities, however, they enroll fewer than 6 percent of U.S. college students. To put it another way, Stanford received approximately 40,000 applications last year when about 3.4 million students graduated from high school across the U.S. The competition for getting into elite colleges seems to be getting more intense, leaving frustrated students, parents, and counselors to wonder: Does it really matter where you go to college? The book is a quick read for stressed-out students and their parents. In it he has plenty of examples and lengthy stories of Americans of all ages and from all walks of life who have found success without degrees from brand-name universities. Bruni points out, for instance, that among the American-born chief executives of the top 100 companies in the Fortune 500, just about 30 went to an Ivy League school or equally selective college. (Bob Iger, the CEO of Disney, graduated from my alma mater, Ithaca College, and unlike many other top executives never got an MBA). Bruni told me last week that he decided to write the book because of the constant chatter among his friends who have kids in high school and among his nieces and nephews “all whipped up in a frenzy” over where to go to college. You wouldn’t know that from conversations at cocktail parties or college nights, particularly in competitive suburban and urban areas, such as Washington, D.C. and New York. There, the talk is all about how to get into the “right college.” I asked Bruni how you change that culture to persuade more of those students and their families to consider a broader array of schools. In turn, guidance counselors take their cues from parents and are often evaluated, especially at private high schools, by how many of their students go to elite colleges. Perhaps the shift away from the admissions frenzy needs to begin with employers who have long used admission to an elite school as a signal of a top job candidate. In the book, Bruni interviews a few employers and venture capitalists and also shows where recruiters say they find their best employees. Many recruiters tell him they are much more focused on the experience of a candidate than where they went to school. And as Bruni points out when the Wall Street Journal asked recruiters the best universities for their entry-level hires, the top five were Penn State, Texas A&M, the University of Illinois, Purdue, and Arizona State. They are all brand-name schools, but they’re also public universities and hardly elite. Bruni worries about the unintended consequences of putting so much pressure on teenagers to get admitted to a selective school. Last year, Bruni taught a course at Princeton and saw firsthand how many students view life as a series of challenges, a set of hoops to jump through, and getting into Princeton was one of them. 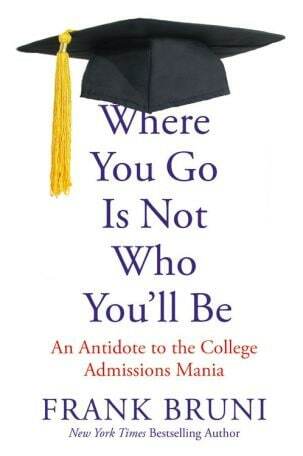 A college alone doesn’t make a successful graduate. Sure, top college provides a peer network that greatly helps both while students are on campus and afterwards as alumni. But someone with grit and ambition can succeed at many different types of schools. The reality is that if those students Bruni taught at Princeton didn’t go there, it’s likely they would have gone to another fairly selective school anyway. So they’ll do just fine. Few students who get rejected by Princeton end up at Northern Michigan University. That’s where Howard Schultz went to college, and today he is CEO of Starbucks. Which college graduates earn the most money right out of school?